As was remarked by the anonymous author of That Great Gothic Fane, published in 1910 to mark the opening of the huge Catholic church of St John the Baptist in Norwich, the idea that his ancestors had been Catholics was as remote for the typical rural Norfolker as was the idea that dinosaurs had once walked the land. And yet, there were pockets in Norfolk where the Catholic Faith not only survived through the long penal years, but flourished, and not as an exotic species. These were the parishes where the local Big Family refused to switch to the new protestant Church of England, but stubbornly clung to the Faith of their forebears. The most steadfast of all these recusant families were probably the Jerninghams of Costessey Hall. It is no exaggeration to say that the Jerninghams were the architects of the survival of the Old Faith in Norwich. Although records of a resident Priest only go back to 1701, Costessey Hall was host to Mass throughout the penal period, one of few places in East Anglia of which that could be said. In the middle years of the 19th century, Costessey Hall was rebuilt to the designs of JC Buckler, an architect with two good Norfolk churches to his name at Welney and Walpole Highway. Buckler was also commissioned to build a mission church to go with the Hall - until then, local Catholics had made use of the Hall chapel. The result is a tall, rather serious building in red brick. The high lancets and strong buttressing create a fortress-like effect, perhaps understandably as the church opened on the 26th of May 1841, just five years after the Reform Act which had made its construction legal. A mark of the success of its design is that we would still be building churches in this style until well into the 1890s, but it has none of the nooks and crannies which we have come to expect of 19th century Catholic churches. Rather, the effect is that of a protestant preaching hall church. The west end has had its severity ameliorated by a modern extension in the early years of the 21st century. Even so, this building would fit well into an industrial town. 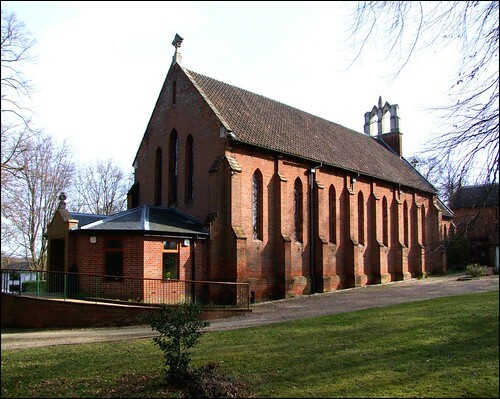 The first Priest of this church was a Dr Husenbeth, who had been appointed chaplain of Costessey Hall in 1820. We may assume that he was largely reponsible for the design of the church, which cost a little under £4500 to build, about eight hundred thousand in today's money, although this amount also included the presbytery and all the furnishings. There were about 400 Catholics living in Costessey at the time, and it is interesting to compare this with the vast Kings Lynn parish, which covered most of north-west Norfolk and which at this time had, according to the Lynn News, less than 150 Catholics all told, and all of them poor. I assume that most of the Costessey Catholics were working for the Hall Estate. The Catholic heirarchy was reintroduced to England in 1851, and at that time St Walstan became a parish church within the vast Diocese of Northampton. An Order of Nuns took up residence in the village, and the Sisters opened a village school. But hard times were coming to Costessey. In 1872, Dr Husenbeth died, and, with the Jerningham family no longer able to support the Church in the parish, the Bishop of Northampton decided not to send another Priest to Costessey, reasoning that his resources would be more usefully deployed in the heart of industrial Norwich. St Walstan's church closed for regular use, and soon fell into decay. The Parish reverted to mission status, with Priests coming out from Holy Apostles chapel in central Norwich to say Mass in the chapel of the Hall. It was not until 1910, coincidentally the year that the church which is now Norwich's Catholic Cathedral was opened, that another Priest was sent to Costessey, and the Parish brought back to life. Our Lady and St Walstan is open every day. You step into the modern extension, and then beyond this the church is all of a piece, the structure and the furnishings all dating from 1841. The interior is as serious as the exterior - Pevsner thought it pleasant but plain. A solid, stone-built west gallery with the linked monograms of Mary and Walstan is a pleasing counterpoint to Buckler's apse of a chancel at the other end. The glass in the chancel is interesting rather than beautiful, its significance coming from its early date. The stations on the walls echo the bench ends, and the font is a simple marble tub in the transitional style. There is a good modern icon of St Walstan, apparently based on a local, and the panelled altar provides a moment of High Victorian splendour. If the architecture of the church is urban in character, its setting is wholly delightful. Although we are just off of Costessey's main street, the church sits on the crest of a ridge which falls rapidly away towards the north-east, and here is a fascinating and lovely Catholic graveyard. The snowdrops still punctuated the spaces between the gravestones when we came this way in April, and among the often elaborate and beautifully carved headstones is a simple cross on a moss-covered pedestal. Beside it is a sign which reads Pray for the Souls of the Jerningham Family, whose bodies were brought from the chapel in Costessey Park and buried here on November 18th 1953. Their names are inscribed in the porch of St Walstan's Church.